NOTE: I published a new piece in Middle East Eye last week on the shady Israeli cyberarms company, the NSO Group, which recently came quite close to sealing a deal with Blackstone Group valuing the company at $1-billion. I hope you’ll give it a read and promote it via social media. As Jared Kushner traveled to the Mideast this week for meetings with Bibi Netanyahu and Mahmoud Abbas, several critical aspects of U.S. policy became clear, which had previously been muddied by vague Trumpian pronouncements. Early in his term, he told an astonished world that the U.S. wasn’t necessarily wedded to the two-state solution. No one could figure out what he meant since there was no other even slightly viable solution on the table. Though of course there were numerous Israeli proposals which everyone knew would not pass muster. One of these Kushner statements was covered by the world media, the other barely was at all; and it was far more important. In his meetings with Abbas, Kushner told him two startling things according to media reports. The first, reported by Al-Hayat and later by Haaretz, was that the U.S. could not pressure Israel for a settlement freeze because it would bring down Netanyahu’s government. The statement in itself is shocking on many accounts: why should Abbas care a fig whether Bibi falls? And if he did fall merely for advocating a settlement freeze then of what use is he in finalizing a peace agreement? Finally, why should the U.S. be channeling the Israeli position on behalf of Bibi? Are we little more than glorified messenger boys for him? Kushner roundly denied the report, claiming he’d never made such a statement. But that’s dubious since it sounds precisely like something Trump and Lesser Trump (Kushner) would say. …The U.S. delegation refrained from committing to a two-state solution — the primary focus of peace efforts for decades….U.S. officials have said that they have not ruled out a two-state solution but that it is up to the two sides, not them, to agree on a way forward. This seeming throw-away line in the article is really monumental. It means that the Trump administration has abandoned a 30-year U.S. policy consensus that the two state solution is the only option for settling the dispute. Progressives have disputed this contention for much of that time. But at least there was a fall-back position that offered a small glimmer of hope for some possible solution if better ones were rejected. But now, two-states has been thrown to the winds. Trump will not advocate for it. Which means, since no one in the Israeli governing coalition supports it, that it is a dead letter. There is no way in hell that the Palestinians, divided and bereft as they are of leadership, can make two-states stick. Israel does not want it and Israel has virtually all the cards. Especially since it’s clear that the U.S. will exert no leverage or pressure on behalf of two-states. I should add that I’m not particularly a fan of two-states. One-state seems far more likely given Israel’s outright rejection of the alternative. But I don’t believe that my own view means much so I’m agnostic on the overall question. It’s vitally important to understand the broader implications: there will be no advances in the peace process as long as Trump is president. We knew this implicitly. But now we see it plain as day. While Palestine has little leverage in getting to a final agreement, it does have veto power. It can say No. The Palestinian No means the peace process is dead. The only way to undue that would be if Arab states like Saudi Arabia could somehow force or cajole the corrupt PA leadership into accepting a sweetheart deal. But I doubt that any amount of money could make even Abbas take such a deal. He would be forever labeled as the one who sold out Palestine. What is there to praise when the U.S. is even backing off what was a pitifully minimalist prior policy advocating two-states? I hate to repeat myself, as I’ve written something like this before: we are in for a wicked few years of chaos and violence given this policy vacuüm caused by Trump’s absconding from a meaningful role. A people with no hope has nothing to lose. If you think you’ve seen violence, it can and will get worse. And in ways we can’t now foresee. Even Peter Beinart, who first noticed the import of the quotation in the Post article, calls the Trump position “absurd.” The only thing I could add is to call it criminally absurd. That is because of this atrocious policy position tens of thousands are likely to die. Among them will be scores, if not hundreds of Israelis (this last statement is meant for the hasbarafia who will likely cheer this development in the comment threads). Leaving it up to the two sides would of course also mean: no military aid to Israel. They know they are not neutral players in this at all. On the up side, during this administration Israel no longer feels the need to pretend. Netanyahu already proclaimed Israel is going to stay in the West Bank ‘for eternity’. (Apparently, using ridiculous Biblical language is in vogue.) That will not go over well in Europe and in the long run also in the US (after this disaster of an administration has finally left). Israel will never be important enough for countries like China, India and Russia to give it the kind of support the US and Europe give. 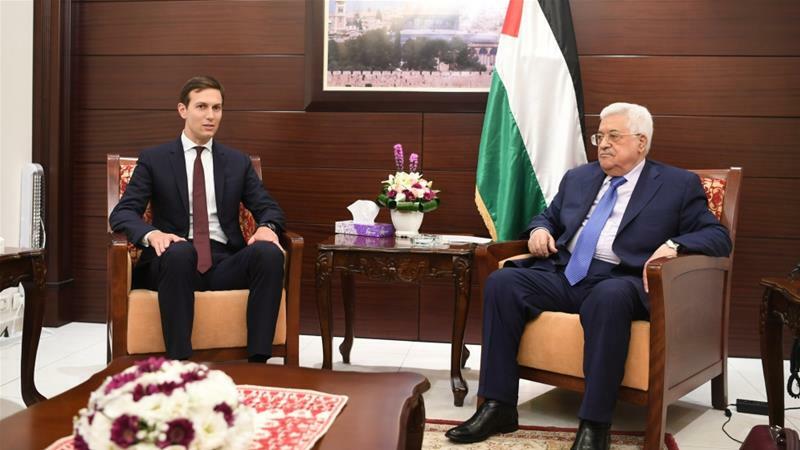 My antennae went up too about this Kushner-Abbas meeting and the implications of what was said by Kushner which represents major policy shift for the US, if that is what it really is/becomes. Not much ripple about it here. Not taking sides on a two state solution, however more impossible it gets IS taking sides!! Again, it buys Israel more time to finish their project of Greater Israel. All along we have been taking sides, putting our heavy thumb on the I-P scale for Israel. I am still surprised Abbas is so seemingly docile. He is also steadfast and does have the power of “no”.